A unique type of museum is coming to New York. An incredible edifice by architect’s studio Adjaye Associates, SPYSCAPE is a spy museum and interactive experience that is set to open in December. Located in midtown Manhattan, it covers 5,574 square metres and houses the secrets of espionage in seven exhibitions featuring intelligence operations, hacking, rare artefacts, exhilarating storytelling, and much more. Strategically designed with transparent and smoked glass and low lighting, the aim is to stimulate discovery and observation. Visitors will journey through a range of viewpoints and perspectives that play with their perception into the various pavilions housing the latest materials and specialised technology found in the sector. Visitors can live the experience using skills in activities designed to hone emotional intelligence in an interrogation, decipher code, avoid lasers and test their powers of observation. The exercises are measured using a system designed by a former head of MI6, which will determine what type of spy they are. ‘It has been exciting to work with a client as truly innovative as SPYSCAPE’, said Lucy Tilley, Associate Director for Adjaye Associates. ‘Thanks to their forward-thinking vision, we have been able to challenge the traditional museum typology with a design that creates a new model of visitor experience which straddles the physical and digital worlds’. 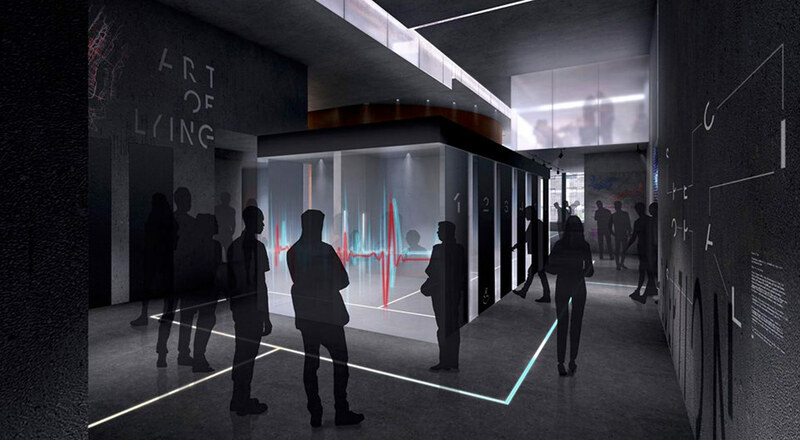 Other elements include a cafe, private event halls, temporary exhibition space and a spy book shop. The museum has materialised thanks to architects and designers, but merit also goes to the former heads of intelligence agencies who have provided expertise in the development of this new concept that will not go unnoticed.